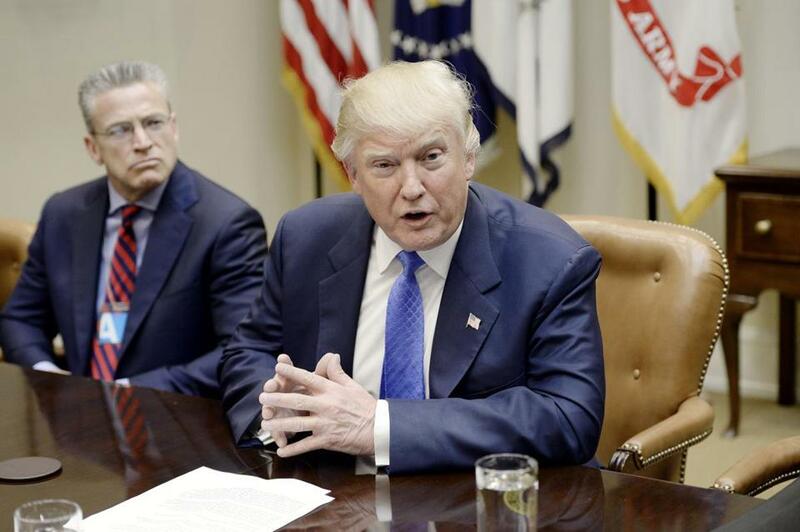 President Trump spoke during a listening session on domestic and international human trafficking on Thursday. The Fast Forward e-mail newsletter has the news that you need to launch your day. Sign up here. What's it like outside? Cool and damp north of the Mass. Pike, but by afternoon, it'll be mild pretty much everywhere, around 60. Commuter alert: If you ride the Blue Line, you'll have to take a shuttle bus between Bowdoin and Airport stations Saturday and Sunday because of track work. The saga apparently began with a casual conversation between chief of staff Reince Priebus and FBI Deputy Director Andrew McCabe, who told Priebus something about The New York Times story that reported the campaign-Russia contacts - perhaps that it was inaccurate, exaggerated - CNN's law enforcement source wouldn't say. All the source said was that McCabe didn't discuss the case itself. Whatever he said prompted Priebus to ask FBI Director James Comey to talk to reporters on background disputing the Times story and a similar story by CNN. Comey refused, so Priebus went on talk shows and did it himself. The FBI and Congress continue to investigate what the Times and CNN said were constant and unusually frequent contact between Trump aides and Russian officials, including members of the Russian spy apparatus. The other CNN eyebrow-raiser says that Trump has enlisted the intelligence community to justify his travel ban on people from seven majority-Muslim countries, causing alarm among some intelligence officials who see it as an attempt to make evidence fit a conclusion. Trump, whose first ban was blocked by federal judges, has vowed to produce a challenge-proof ban. One of the faults the judges found with the original edict was that it failed to demonstrate that an immigrant or refugee from any of the seven countries had committed an act of terrorism in the U.S. So now the White House is saying that Homeland Security and the Justice Department are working on a report that will, indeed, show a "substantial" security threat from those countries and that all of them have exported terrorism here. The White House denies both accounts. Watch for more developments today. Hey, sport: The Celtics, who stood pat as the trading deadline passed yesterday, are back in action tonight after an eight-day All-Star break. They face the Raptors in Toronto, against whom they have a 1-2 record this season (8 p.m. on CSNHD, ESPN, and 98.5 FM). They'll be in Detroit Sunday to play the Pistons (6 p.m. on CSNHD and 98.5 FM). The Bruins are off until Sunday afternoon, when they'll take on the Stars in Dallas (12:30 p.m. ET, NBC and 98.5 FM). Last night, they beat the Kings, 4-1. That's a 5-1 record since the new guy took over. Trump tosses some red meat today to the fired-up faithful at CPAC, the annual conservative lovefest he snubbed last year in order to campaign amid rumors that he'd be booed. Remember, the conservative movement was solidly in the hands of establishment Republicans at this time last year; today Team Trump's isolationist nationalists are on the rise. He addresses the gathering at 10 a.m. Anybody else wondering whatever happened to Sarah Palin? 'You requested it.' 'No, you requested it.' 'Did not.' 'Did too.' Trump meets with nemesis John Kasich, governor of Ohio, at the White House this afternoon after WH press secretary Sean Spicer said Kasich's office had asked for the meeting multiple times; Kasich's spokesman tweeted that it was Trump who made "repeated requests." Okay, boys; all we care about is what you discuss. Trump will save taxpayers $3 million this weekend by staying at the White House to practice his speech to Congress (written by aide Steven Miller), scheduled for Tuesday night, instead of jetting to Mar-a-Lago, his Palm Beach resort. In just a month, he has spent about $10 million on these trips; not sure if that includes his multiple rounds of golf. It does not include the multi-millionaire Secret Service tab racked up so far by his sons traveling on Trump Inc. business. The pampered prez is on pace to spend more in a year than Obama spent in eight years ($97 million). And this by a guy who was brutal in his trashing of Obama for traveling too much, vacationing too much, and golfing too much. Guess Trump follows Miss Piggy's credo: Too much is never enough. If you think there's a divide in the conservative movement, wait until the Democrats hold their vote for national committee chair during the DNC winter meeting in Atlanta Saturday. The left-wing Bernie Sanders/Elizabeth Warren/Michael Moore segment of the party favor US Representative Keith Ellison of Minnesota, but he's been dogged by accusations of anti-Semitism: He was associated with the Nation of Islam in the past, and in 2010 was recorded saying that U.S. foreign policy is "governed' by Israeli interests. While some liberal Jews support his DNC candidacy, other prominent Jewish figures don't. Attorney Alan Dershowitz, for example, vowed to quit the Democratic Party and stop donating to it if Ellison is chosen. He supposedly is neck-and-neck with former Labor secretary Tom Perez, backed by more mainstream Dems. Should be quite the show. Misc. : Former Boston community activist Mel King is being honored this morning by the UMass Boston Center for Collaborative Leadership ... Vice Admiral Umio Otsuka talks about the threat China poses in the South China sea and North Korea's recent rocket launches at noon at Tufts University in Medford ... The New England First Amendment Coalition hands out its annual awards at a 12:30luncheon at the Marriott Long Wharf; Trump's attacks on the media are sure to be front and center. I was going to suggest that you escape all this political stuff by watching the Oscars Sunday night (7 p.m., ABC), and then I remembered oh yeah, it's Hollywood. Anyway, it will be interesting to see if "La La Land" is the big winner as everyone is predicting. There are many other things to do this weekend as well; check out The Weekender. Finally, many of the national special days I mention in this space are fun, bordering on frivolous: Rotisserie Chicken Day, Talk Like a Pirate Day, Barbie and Barney Backlash Day (yes, that's really a thing). But today's one of those days where the designation has a serious message: It's National Skip the Straw Day. Kids at Whitehall Middle School in Michigan who belong to a group called the Coral Keepers, and their advisor Susan Tate, successfully petitioned the National Day Calendar folks to recognize their effort to protect the environment by asking people to forego plastic drinking straws today -- and actually, every day -- and drink directly from a glass. Even though the Whitehall students focus on saving coral reefs that are being devastated by excess carbon in ocean water, they also expand their advocacy to other environmental issues. Even little things like straws that actually are very big things. 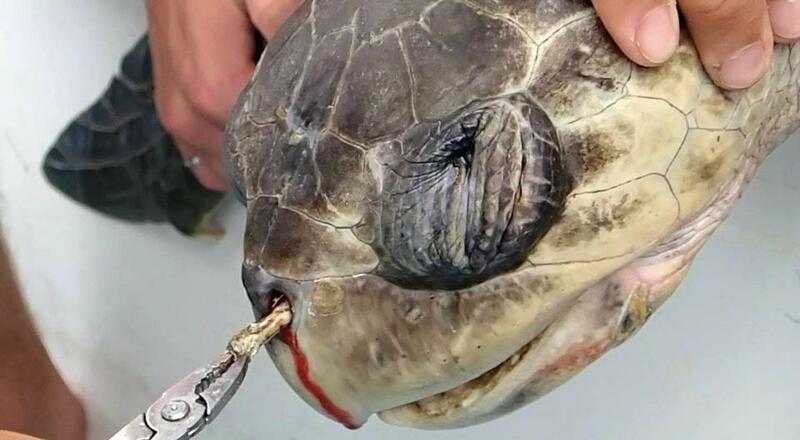 They were moved to act by this viral video by the Plastic Pollution Coalition showing researchers removing a plastic straw lodged in a sea turtle's nose and throat. I guarantee you'll remember this the next time you start to unwrap a plastic straw. Researchers found this sea turtle with a plastic straw lodged in its nose and throat. Thanks for reading. My town has banned plastic bags; I recycle, but I can do more. Especially if I can save a turtle's life. Send questions, comments, or news tips to teresa.hanafin@globe.com, or follow me on Twitter @BostonTeresa. Have a good weekend; see you Monday. Please tell your friends about Fast Forward! They can sign up here. The Globe has lots of other e-mail newsletters that are almost as good as this one, from breaking news alerts to sports, politics, business, and entertainment -- check them out.